Discussion that is currently taking place all over, including pages of this magazine (Droug, A.K), about the future of Siberian breed has elicited important antagonisms existing within society of the lovers of famous Russian indigenous cat. Apart from these opposite views, most disturbing is the fact that many members of this society don’t have clear vision of how the breed would have been developed. Why it is so important? No emergency brakes allowed in planes. Likewise, biological evolution does not permit “bus stops” to land down and relax with impunity. An evolutionary “stop” frequently results in steep and hardly surmountable regression. This is true for natural evolution and is even more true for the artificial one. Lack of understanding of some basic biological principles other than applied genetics of fur coloration can play bad joke with a breeder. It is especially true in the case of young breeds that require significant work for stabilization of the cat type. Being captured in this maze, a number of breeders as well as cat judges flooded Russian Internet resources and printed media, with their opinions regarding Siberian breed, which often lack any felinological content, yet full of emotions and finger-poking. The energy and stubbornness of these persons would be better used in some other, more focused and peaceful purposes. In fact, it’s hard, to get rid of a thought that in the fire of emotions none of these persons remember about cats. In this article it would be better to put this entire discussion apart and to concentrate on the first and foremost issue of the breeder, the cats themselves. However, this way can be much more difficult, rather than it looks at a glance. In reality, phenotype (or “type”) similarities occurring in natural cat populations do not necessarily reflect high level of identity between cats’ genotypes. Prevalence of certain stably reproducible phenotype in a cat population does not necessarily indicate that upon active artificial selection within a part of this population, this stability will be preserved and than easily diverted towards desired changes. The basis of native breed is determined by the majority of felinologists as the product of the spontaneous selection in the isolated synanthropic population with common phenotype. Only in cat populations that are sufficiently large and relatively isolated for long periods of time (many decades, or, better, centuries), the genotype is also stabilized. Only such population can be converted to a native breed without undue difficulty. Role of artificial selection preceded to the native breed formation can be negligible (NFC, MCO), as well as significant (KOR). The latter considered as “cats of fortune”, and even almost sacred animals in their homeland. The pathway of stabilization of the population is thus insignificant, only long period of any kind of stabilizing selection of either type is required to achieve the genotype homogeneity. Still, from geneticist’s point of view, any population of synanthropic cats is much more diverse, not to say chaotic than the “normal” biological species. Nevertheless, such population obeys general biological laws. Knowledge about these rules or patterns, during the breed creation and development can help to avoid the movement to a wrong direction that can finally bring a breeder to the blind alley (without even alley cats – A. K.). Formation of the population’s genotype (i.e. the sum and the distribution of all genes of the population) is described in terms of matching part of genetics, the population genetics. Knowledge of the basics of this discipline would be very helpful to the participants of the discussion about Siberians and Neva Masquerade cats if they really interested to figure out some origins of the problem. Let us start from the rudiments. Where “Siberian” phenotype comes from, what is a Siberian cat now, and what do we want to see in it in the future? Some felinologists assume that certain archetypical cat in the past formed the ancestry of many, if not all semi-longhair and longhair cats. The latter were subjected to intense artificial selection. One can note that the fur of truly longhaired cats, such as Persians, is, most probably a product of a long artificial selection. It’s hard to imagine that the fur of Persians’ would confer to the wild or semi wild cats any advantages during the natural selection. A dense semi-long coat, subjected to season changes is quite different in terms of selective advantage in natural conditions. Obviously, even two centuries ago the human civilization was absolutely different from what is seen now, and the role of nature’s factors in evolution of domestic animals was much higher. 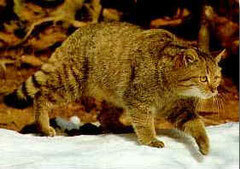 Commonly accepted ancestor of domestic cat is African wildcat, Felis lybica. Given the differences between cats of Middle East origin and classic shorthair cats which are direct descendants of Egypt cats, and, therefore, of F. lybica, and to a smaller extent of Felis chaus (jungle cat), one can assume that semi longhair cats of Middle East acquired significant proportion of genetic material from other cats. The features such as fur structure and length, solidly built body, and some other phenotype elements are unlikely to evolve within the several centuries in Middle East cats. 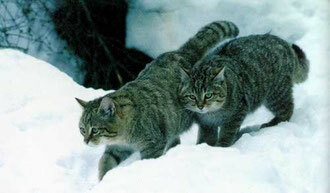 A forest wildcat, Felis silvestris, or to be precise, its subspecies is the most likely contributor. Parenthetically, it should be noted that zoologists count more than 20 subspecies of F. silvestris. Best known one is European wildcat whose role in evolution of domestic cats in Europe is usually negated. However, the habitat of the forest wildcat does not limited by Europe and includes Middle East, Turkey, Caucasus, and partially even more eastern regions such as Iran. Some divergent subspecies of F. silvestris live in India and in Tibet as well. The habitat area of Middle East subspecies overlaps with those of F. chaus and F. lybica as well. It is this region, where the major focus of old LH and SLH cats (TUA, TUV in Turkey and LH cats in Iran) is located. This area can be considered as ancient homeland for LH and SLH cats. 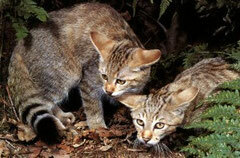 The subspecies of forest wildcat in Middle East is known as Felis silvestris caucasica. Its fur is dense, and contains well-developed undercoat in winter. And that’s not surprising. Harsh winters are not rare in Caucasus Minor mountains, and in Turkey and Iran highlands as well. Much of those territories are higher than 1500 meters above the sea level, and in winter nights the temperature can drop to -30°C. Speed of winter winds in this region is also high. Summer, on the other hand, is very hot and dry. That is the reason why F. silvestris caucasica have a semi long fur with dense undercoat shedding during warm period. As we can see from the picture, F. caucasica is characterized by a brawny cylindrical body, rounded head with blunted muzzle, and visible but not accented transition from relatively sloping forehead to nose, quite short massive legs, and relatively short tail. In other words…reminds quite a lot…yes, a Siberian breed. Is this an accidental coincidence? Most probably it is not. An anecdote from Soviet era comes to mind, about the pilferer, who purloined components from the firearms factory, which also produced bicycles or other civilian stuff…doesn’t matter, in hope to assemble something for home use, but every time he tried – he got Kalashnikovs… Let him off easy, because this simple anecdote serves as a great illustration of basic genetic postulates and points at the case under discussion as well. How exactly, the genes defining long fur, emerged in the population of house cats is not known. It is however not particularly important whether wild SLH cats have been domesticated independently, or cats migrated from a major domestication centres in Egypt and Asia Minor to the East, acquired the appropriate genetic material from the wildcats on their way. Important is, that as a result, Siberian cat has a clearly identifiable phenotypical prototype; most probably it is the Eastern subspecies of European forest cat located in Caucasus and Asia Minor region. Although the fur of the European forest cat cannot be qualified as fully “short”, is still hard to compare with dense and hard fur of F. silvestris caucasica. Interestingly, the plasticity of the wildcat is so high that in the mountains regions of Europe, the Alps and Pyrenees, the length of fur of wild forest cats increases comparing to “classic” European wildcat (see the picture). Thus, characteristic features of Caucasian forest cat, which allowed it to survive in continental climate, with harsh winter in the highland forests, played a big role in the modern standard of Siberians. That is why preservation of these features, accenting and unification of these features in Siberian breed would be the wisest way in the breed development. Currently, F. silvestris caucasica is endangered species placed into the Red Book of Russian Federation. It is under state law protection in Armenia as well. This fact, which lacks direct relation to the discussed issue is brought for the reason, so I can bring you back to the problem of behaviour of population in the process of natural evolution as well as in the process of beginning and development of the breed. When a species is considered as endangered? It happens when the population numbers decrease to a few thousand animals. At this point, the population fate fall under influence of circumstances that can abruptly change the way of natural selection. In population genetics such processes are termed as “genetic drift” and “bottleneck effect”. These processes can induce replacement of characteristic population genotype by totally different one, which was present in the initial population in a very small proportion. In artificial selection within small population with unknown genotype it is very difficult to predict selection outcome and, accordingly, difficult to achieve desired stable changes in the phenotype. In other words, the more is degree of genetic diversity in small population taken for selection, the less is the chance of its successful “guiding” towards desired phenotype. This means, that during selection, towards for example, a fur colour, some other unwanted change in phenotype can happen. These can be changes in length of legs, form of head, fixation of predisposition to a hereditary disease, and other. And the chances of such unwanted effects grow with the decrease in the population size and with each generation born in such population separated from the original gene pool. After all, let’s see how many Siberians of good quality at this time are actively participating in selection in Russia and countries of ex – USSR? Rough calculations made with the help of the Internet show that number of these animals does not exceed one and a half to two thousands. Besides, if consider that a big part of them doesn’t have even theoretical opportunity to mate with each other, and many subpopulations of Siberians are highly inbred, the situation looks even more serious. Although Siberian cats are not under direct threat of extinction, the quality of the mating in their population from the point of view of preserving in the mentioned genetic terms and purposeful improvement of the breed is at the level, which is characteristic for the most dangerous situation, described in the Red Book. There is something to think about, isn’t it? We outlined here past and present of Siberian cats and discussed general problems encountered in development of native breeds starting from the “wild” populations. In the second part we turn the attention directly to the situation with Neva Masquerade cats, their relation to the Siberian breed, their origin, etc applying the topics discussed in the Part 1.